John and I had decided to walk the Bristol Avon to see where we could find the large roach that inhabit the river. Summer time gives a great opportunity to try and find these beautiful fish. The sun was shinning and it was 28c so very good spotting conditions. We started at the very top end of the river on a trout syndicate stretch where it’s the best part of £600 per season to fish. I’ve had some huge roach from here in the past, when you can fish it in the winter. It’s also quite possibly the highest point upstream on this particular arm of the Bristol Avon where roach can be found. Unfortunately there was an algae bloom on the water and we couldn’t see into the deeper pools where the roach are. It had been 10 years or so since I last fished there and they had managed and changed the bankside considerably, however not to the detriment of the fishery, more of an enhancement. Next we went down into the town of Malmesbury where again the river was coloured and we saw nothing. However on another arm of the Avon the river was crystal clear and it was here where we spotted many shoals of roach. Nothing that was much larger than 1lb or so, but roach exisited in almost every swim. There were also many different year classes which looks great for the future. We also saw 5 chub grouped together. These fish were all around the 4lb+ mark with one that looked slightly bigger. The next stop was at a location just above Chippenham where we saw some really big roach of well over 2lbs, swimming amongst the barbel and chub. These fish would be certainly worth a visit in the winter. There were probably about 4-5 of them in a lovely pool. The day was really warm and I’m just pleased I had put the sun cream on. I soon drank the 1.5 litres of squash I had bought along too. We went further downstream and saw some other roach which again might have gone over 1lb but no other huge fish. 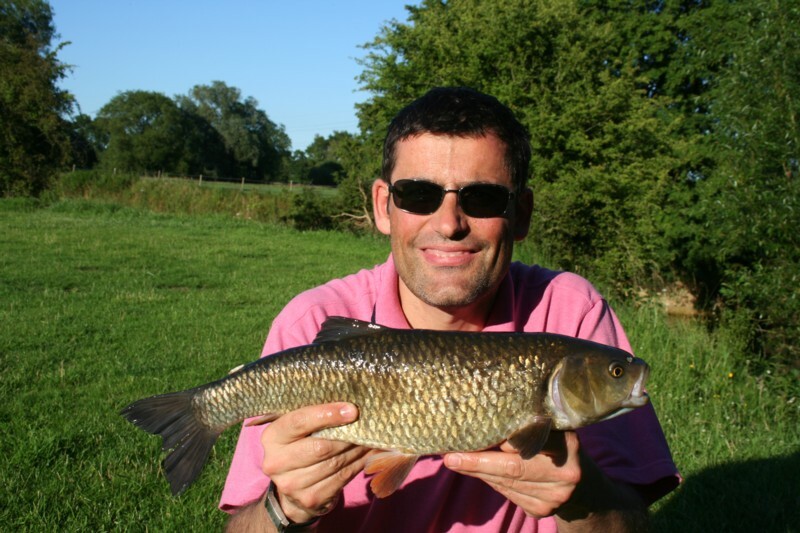 Although I showed John some swims that have produced some huge roach of over 2lbs last year. There were a few barbel guy’s that I knew fishing there and one had a good start to the season with a 10 and an 11 lber under his belt, well not under his belt exactly but had graced his net. I showed John a very tight little swim that I am going to fish this week. I’ve seen some huge fish over 12lbs in there, although I looked last week and saw nothing, but they are there. With the afternoon moving into evening we had done enough walking and decided to have a fish for a chub or barbel. So a short drive later we arrived at a swim where the chances are reasonably good. I put the hemp in while John tackled up. The action was almost instant and a chub of 3lbs 6oz came to the net. The bait we were using was the simple pellet on a hair rig and a bolt rig lead being the final part. I put out some more hemp and pellets not expecting another bite so soon John was playing another chub which was a brother or sister because it weighed in at 3lbs 7oz. Another chub just 1oz larger at 3lbs 7oz. The action did continue with 2 more lost chub, a rainbow trout which was jumping for the Olympic team or so it seemed. 2 other chub were landed which were smaller. 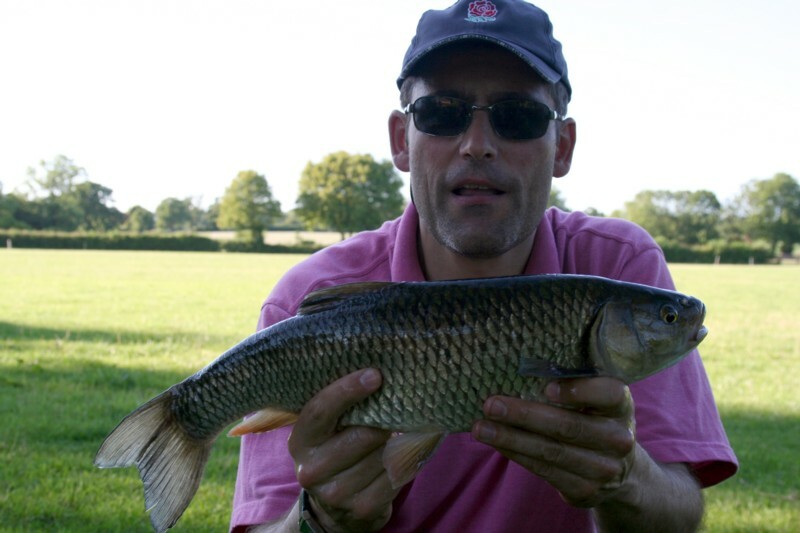 I was disappointed that we didn’t get a barbel or a larger chub but for the 2 hrs we were fishing it wasn’t too bad. So mission accomplished and a plan needs to be hatched for the winter’s roach sessions on the river. This entry was posted on Tuesday, June 28th, 2011 at 10:03 am	and is filed under Uncategorized. You can follow any responses to this entry through the RSS 2.0 feed. Both comments and pings are currently closed.